The Aquatica Housing for Panasonic GH5 & GH5S cameras is a top-of-the-line underwater housing with full camera control, large molded grips and a complete selection of ports. The housing includes a flash trigger for shooting strobes via fiber optics and allows for a deep rated option at no additional charge. With Aquatica's self-aligning controls, camera installation is a breeze. The housing is constructed of high-quality aluminum with a rough powder coated finish to stand up to the toughest ocean environments. The Ikelite Housing for Panasonic GH5 is also compatible with Panasonic GH5S. This housing offers quality, performance and reliability without the added cost of an aluminum housing. 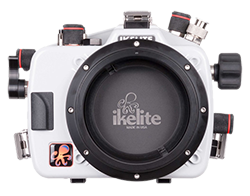 The new lightweight, but stronger cream polycarbonate alloy allows for a smaller overall housing, but Ikelite still has a clear back plate allowing you to easily view inside to your camera. The drylock port system is easy to use and secure with a variety of ports for any lens. The Nauticam NA-GH5 for the Panasonic GH5 & GH5S camera provides a professional level experience for underwater photography. 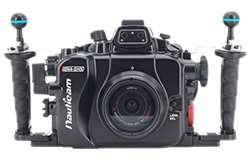 With emphasis on ergonomics and control, all camera functions are available from the housing, it is comfortable to hold and use underwater. Nauticam provides options for a variety of accessories, including dedicated ports for external monitors, and sturdy tripod attachments. 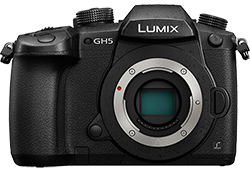 The Panasonic GH5 camera is one of the best mirrorless cameras on the market. The Panasonic GH series has long been known as a video powerhouse with more options and higher quality recording codecs available. The GH5 is no different than previous versions and continues to build off that foundation, offering 4k / 60p video record that uses the full sensor to capture video. It features 20MP resolution with a high res - 6k photo mode. Quality, low light performance, image stabilization and more have been improved from the GH4 to offer a fully loaded, professional level mirrorless camera.